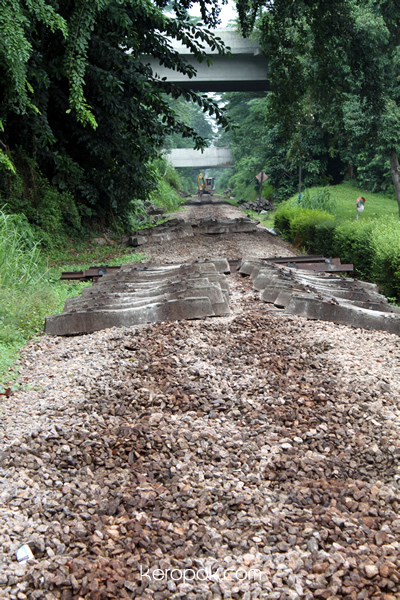 The former KTM tracks along Rifle Range. Looks like they have started to dismantle the tracks here now. I was waiting for the bus at the bus stop and saw some folks crossing the tracks from their housing estate. Walked and snap a few photos of the tracks. Wondering what will happen after this. 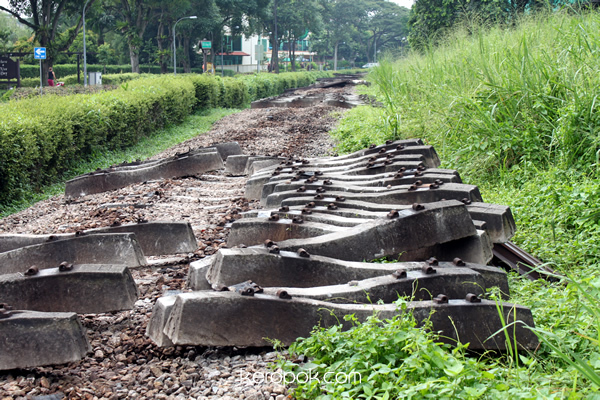 Watched a travel documentary on TV yesterday how they transformed an old railway track in Taiwan to be a bicycle track. Looks so interesting. Hopefully they will do something similar in Singapore. Saw this literally 'green building'. It's in the CBD and I won't be able to afford this. 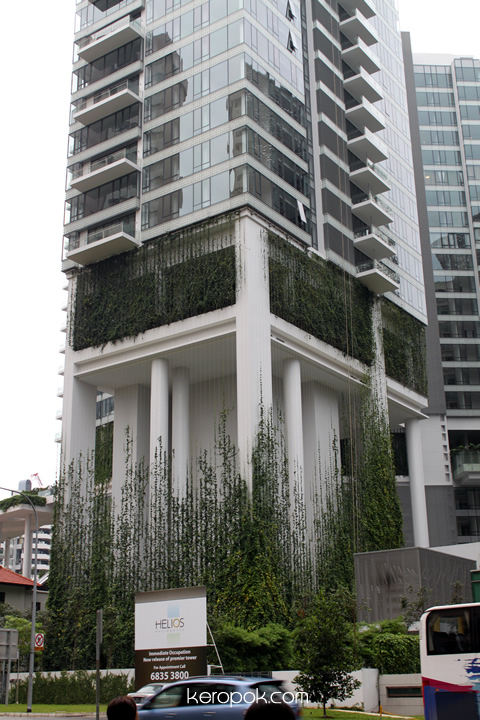 It's interesting how buildings are getting 'green' nowadays. I wonder what other green stuff they have inside. Sometimes it might be difficult for people here who are used to certain way things should be to become green. 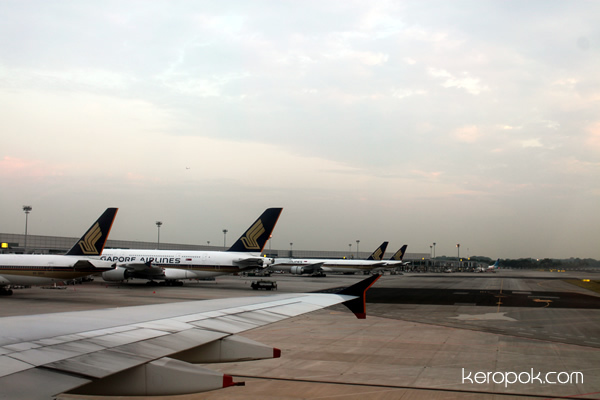 Eg: I was in Hong Kong airport recently and realised they used rain water for flushing the toilet. The water is not crystal clear like how we are used to here in Singapore. When I went into the toilet, I thought the person before me had not flush! Then when I flushed, I realise the water is not clean, and wanted to flush again. It was then I realised it was rain water! Would locals here (or you) accept slightly murky water for flushing? If they are going to process it crystal clean, what's the point, that would be counter productive, it will take more energy to clean it up. Ikea sends you their "Book of Temptation" around this time of the year. 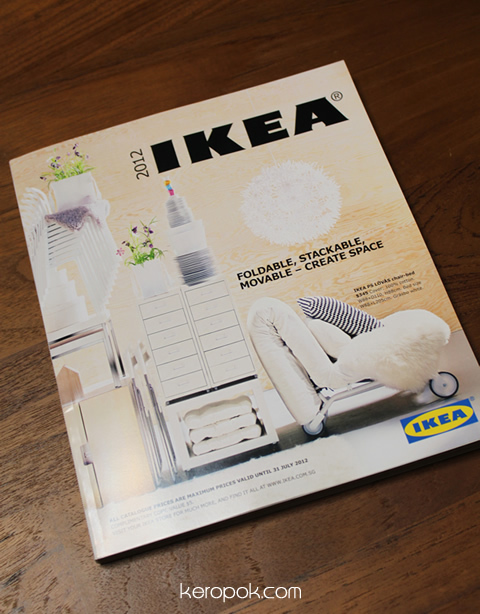 You flip their catalogue and you want almost everything in it! Our house is already Ikea-enough! I like how they can make a small space so liveable in their showrooms! It's nice to have free Wifi and Internet terminals in most Asian Airports. The wifi works for sure in Changi Airport. But if you are not a local, you need to register. 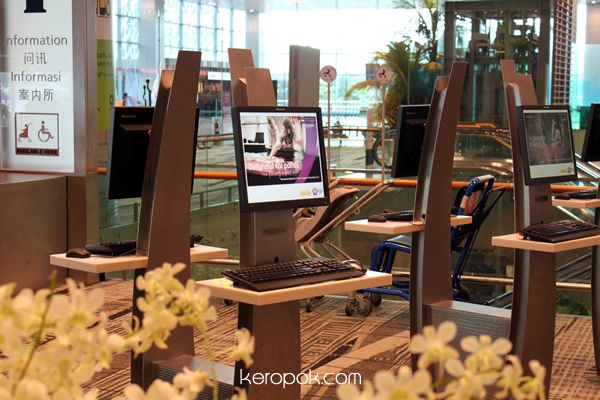 If not, use one of these modern looking terminals around the airport. I think Hong Kong's airport is the best. The moment you touch down and waiting for the long queue to clear immigration, you get signal! All you need to do is click OK to their terms and conditions and you are connected, no registration required! Saw this car yesterday and wanted to laugh. 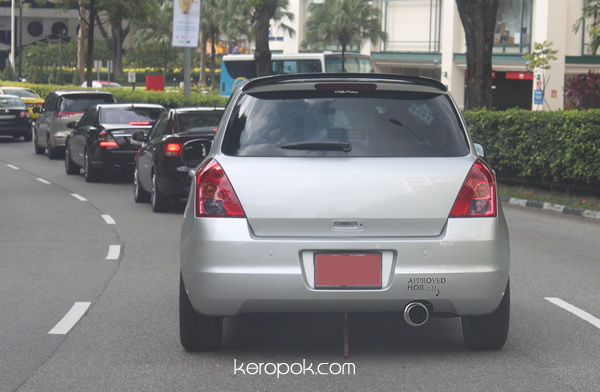 The owner of the car had a modified exhaust pipe and it says 'Approved Hor...!!' on the bumper. Sounds so 'Ah Beng / Ah Lian'. I am having a Staycation Friday/Saturday right here in Singapore. 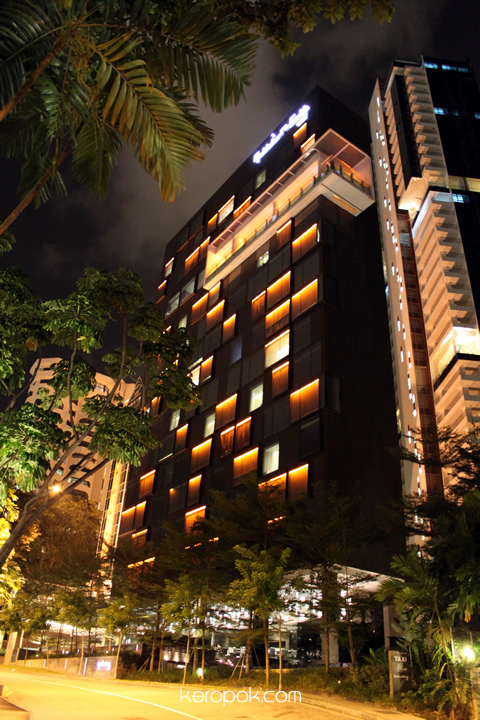 Got off work and check-in into the hotel, a swanky hotel called Quincy Hotel at Mount Elizabeth, which is just off Orchard Road! It's the Top 10 Trendiest Hotel in Asia according to TripAdvisor. Truth be told, I did not know the existence of this hotel until last week! It's an interesting hotel that with the rate you pay, everything's included, wifi/internet, breakfast, lunch, dinner, mini bar in the room! Time to choose your favourite TAN. Most household should have gotten this in the snail mail. Poll card that tells you where the electoral division and polling district is. 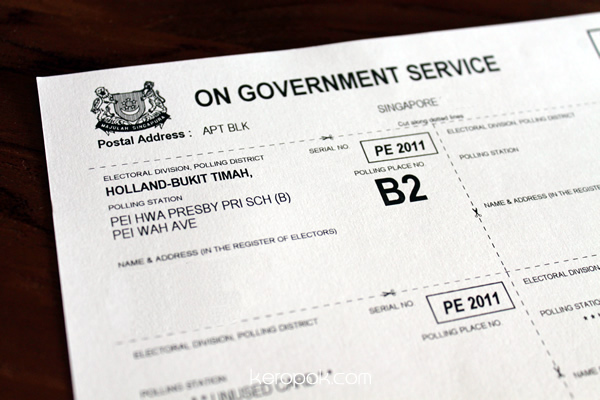 If eligible voters should get their poll cards within 3 days of Nomination Day, which was on August 17, 2011. If you don't get it, this time round, you can print it yourself! 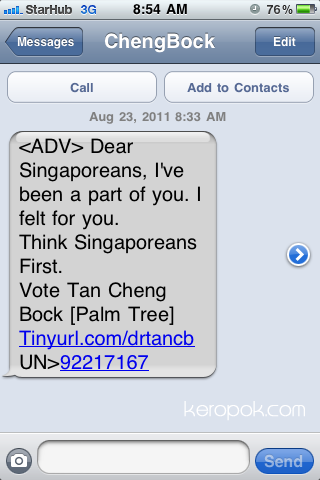 Go to http://www.elections.gov.sg to print it! Which TAN would you like to be President? Oh yes, if you are an NUS Student, you will be voting for who will be Chancellor too! Wow, they are fast! I just saw this at around 10 PM at Holland Village. 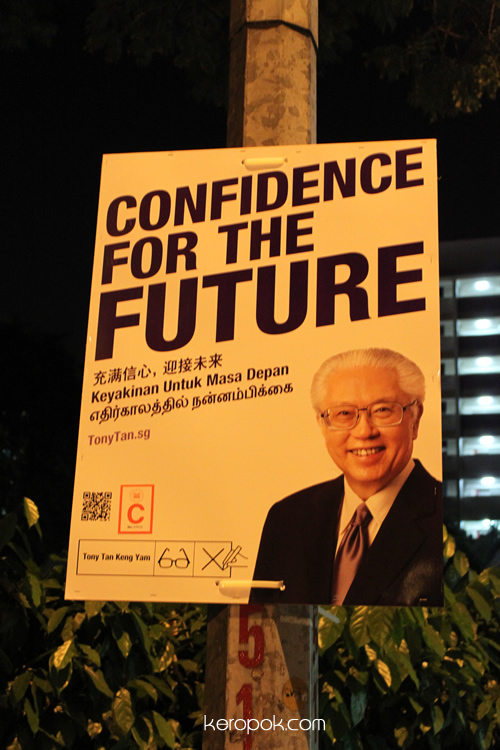 One of the 4 Tans have already started to put up the posters for the upcoming Singapore Presidential Election. I have yet to see the other 3's posters yet. 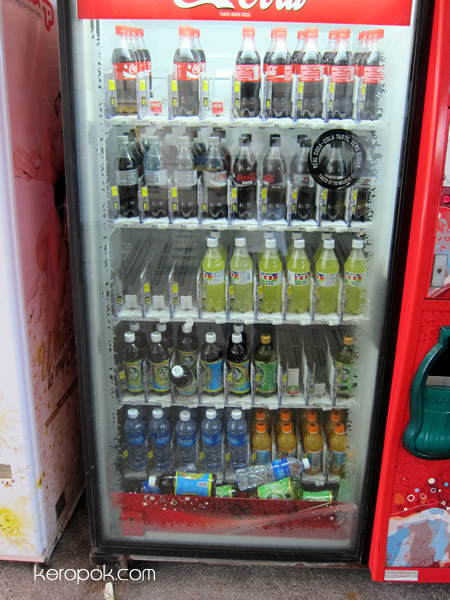 Better hurry and don't 'tan gu gu'. I read that there is a maximum of 9,400 posters and 200 banners that is allowed to be printed by each one of them. 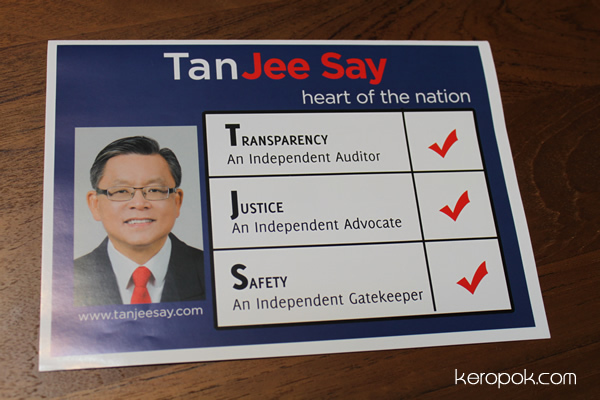 Look at the bottom left of the poster, you notice the logo for his ballot paper? So who will win on the 27 August? 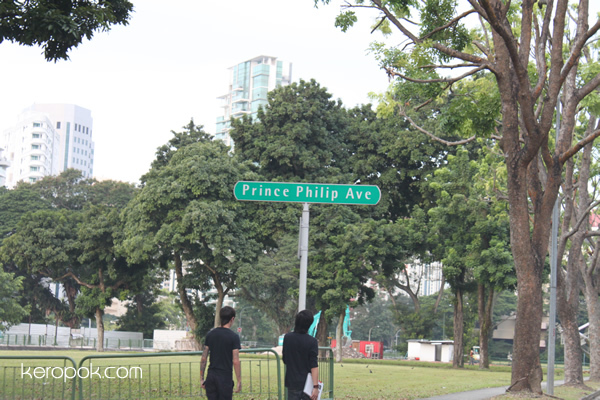 The winner will move in to the isTANa! Abercrombie & Fitch really wants to catch everyone's attention. Everyone can't help but look at the half naked man's on a billboard. Not only women look at it, men too! If you want a body like that? Well, exercise at the gym on the 2nd floor just beside the billboard! The gym I heard has the highest subscription fee around town. Why did they ban it? Aren't all the bra adverts more revealing than this ad? For some reason, I just LOVE this road. I was walking home one day and saw this. 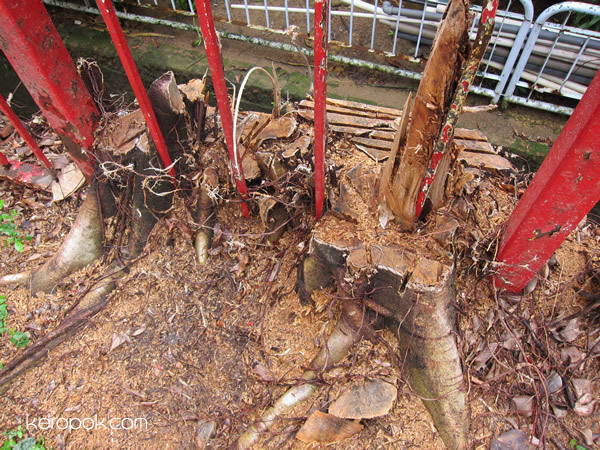 The town council cleared off the tree that has grown over the years into the fence. The tree must have grown quite big over the years. Guess what? I have not noticed that there was a tree there until it was cut off! Sometimes we are just so oblivious to our surroundings. 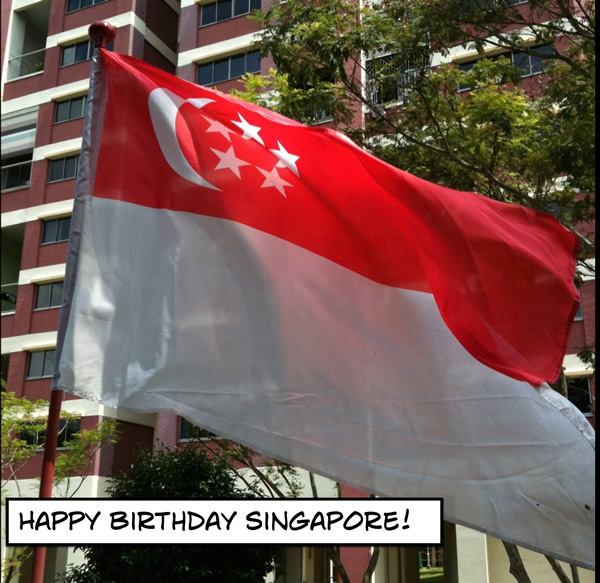 Singapore's 46 years old this year. Every year, there's a celebration with a huge National Day Parade. I saw over the weekend at the suburb of Choa Chu Kang. I seldom visit to this suburb, but was here to visit a friend's house. I thought the National Day decorations at this place is quite unique. "Majulah! The Singapore Spirit", is the theme for National Day Parade 2011. Majulah, is a Malay word that can be translated to "Onward" in English. 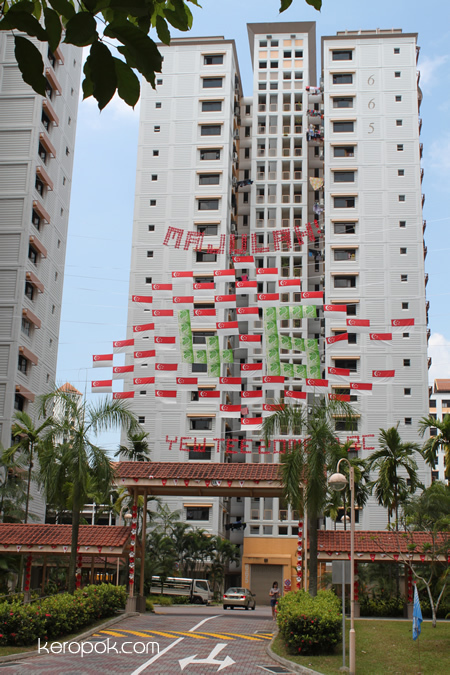 "Majulah Singapura" is also the name of the National Anthem of Singapore. The word, Majulah seems be on everyone's mind. Guess what? 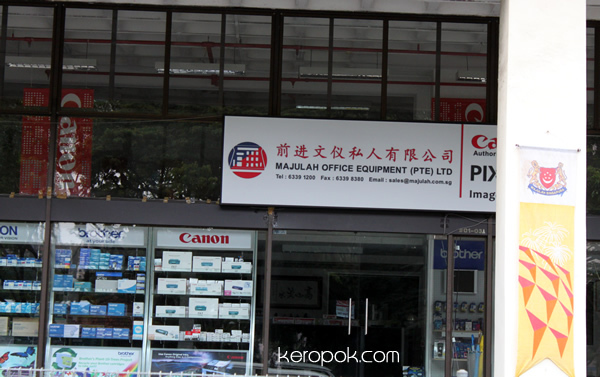 I happen to see the name of the shop who is called Majulah Office Equipment! I came across this fire hydrant recently. I have not seen this before. 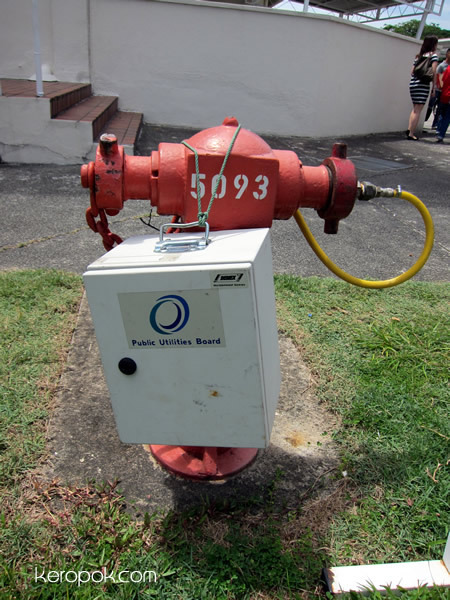 Fire hydrants should come under the care of the Civil Defence. But the white box has a Public Utilities Board sticker on it. I am guessing they are testing the water quality? But it's weird to test water quality of water meant for fire rescue. Is it testing the pressure of the water supply? Recently, my colleagues and I have all been volunteered as fire wardens at our workplace. We have no idea why, but it seems the duties are rotated. We were all sent off to attend a fire safety course. After the course, our views of being a fire warden changed! We did not know it was so important! Some of us were quite into it and found out that the public in Singapore can be fireman as well! I saw that some of the requirements are interesting. Your BMI must be 27 and below and if you are short sighted, your degress cannot be above 500 degrees. There's height and weigh requirements too, no wonder they are tall. The sculptures at Clementi Mall is quite nice don't you think? I like to 'stare' at public sculptures though I can't appreciate it like most people do. I used stare and not admire because I think what I do is literally stare at it. What do you see when you stare at it? I think of the X-Men movie, the bad guy who can extract iron from blood, he can also transform into different shapes, I see the water bubble above and think of Magneto! My imagination goes wild sometimes! 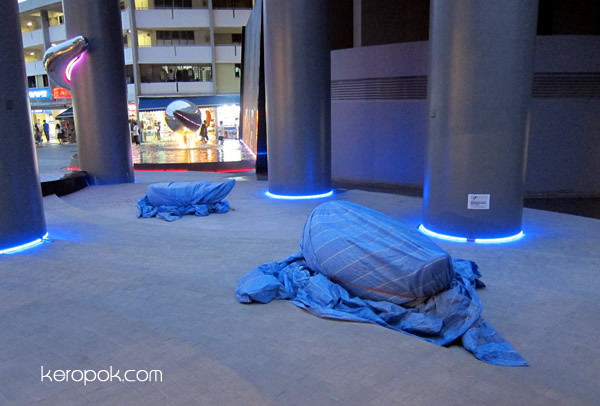 HDB probably thinks that Magneto has arrived in Clementi and decided to wrap the sculptures in tarpaulin. haha.. 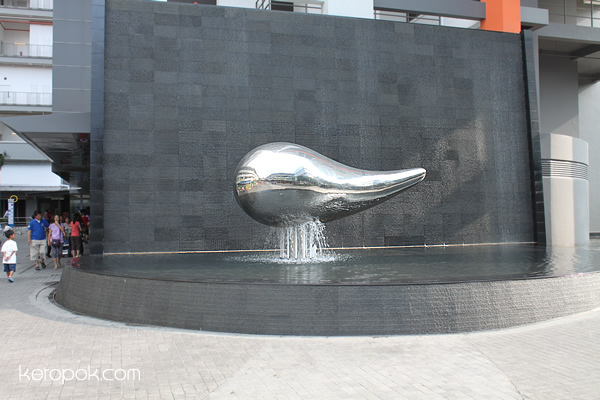 The reason they gave is that the sculptures becomes too hot during the day and people might get burnt when they touch it. 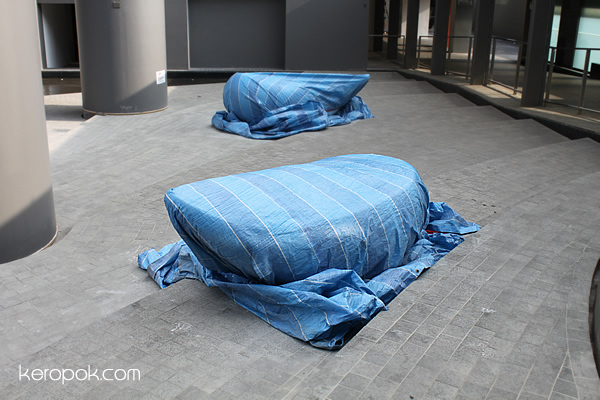 They want to prevent getting burnt by wrapping the sculptures up. They have also asked the sculptor to move them away. Why? Don't move it away... It looks nice day or night! Wrapping them up looks ugly. Are you fascinated by these spiral staircases? I am! It can be found in older / olden buildings in Singapore. Looking at the this photo, you can see they use the small square tiles. 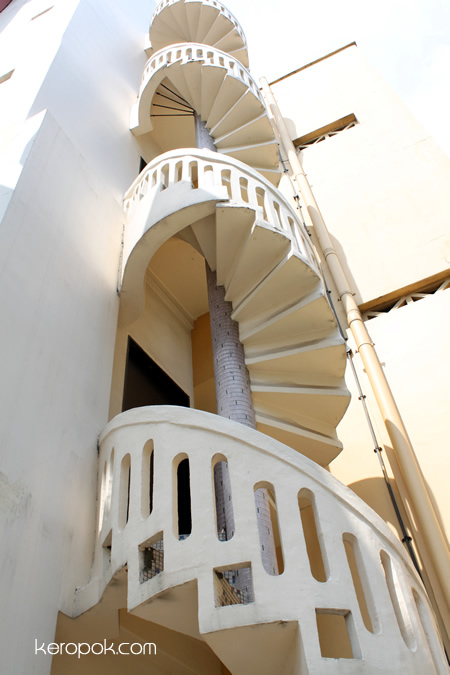 The older HDB flats like the conservation flats in Tiong Bahru have these spiral staircases as well. They are emergency exits and usually located at the back of the house, where the kitchen is. I wonder why after certain years, they don't have the 2nd door or emergency exits for HDBs in Singapore? It's the first day of August and it's Theme Day for the City Daily Photo bloggers. Here a train that I took on the last day of June. 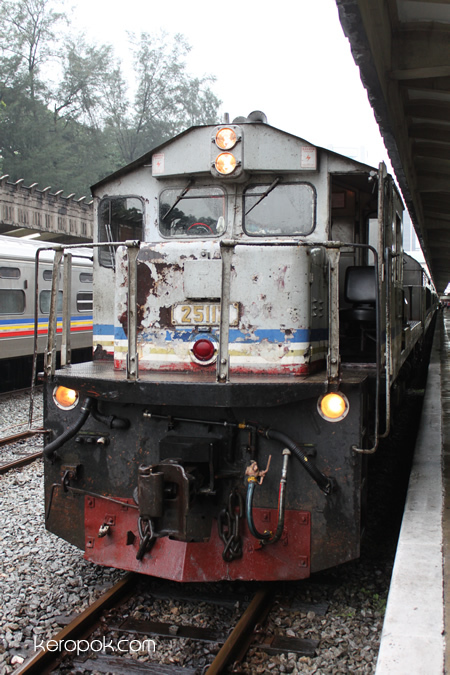 It was also the last day of operation of the KTM Trains in Singapore. Want to know other city bloggers around the world are showing?